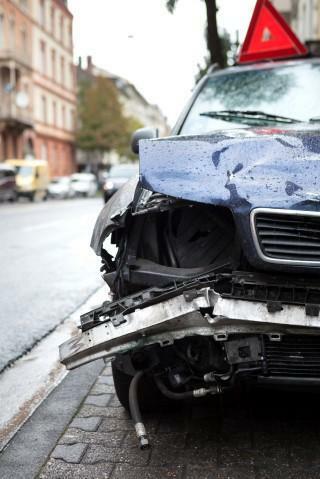 WHO PAYS FOR DAMAGES IN A HIT AND RUN ACCIDENT? Many of us have been there: You walk out of the grocery store with a basket full of bags, already dreaming of the new recipe you’re going to try for dinner. As you approach your car, your stomach drops. Is that your car? The one with the big, fresh scrape across the front left fender? You look around for possible perpetrators, but there’s no one in sight. There’s no note on your windshield, either. You’ve been the victim of a hit and run. What now? In general, a person commits a “hit and run” if he/she is involved in a car accident – either with a person, another car, or a fixed object like a sign or building – and does not stay to give his/her information or give aid to anyone who was injured. In an hit and run accident, if the fleeing driver is found through video or witness evidence, then that driver will not only be liable for paying compensation to the victim, but might also have to pay punitive damages. However, if the driver is not found, then the victim’s only option for seeking compensation is with their own insurance company. Do you know the type of accident coverage you have under your existing auto insurance policy? If not, now would be a good time to check. There are a few types of coverage that can prove valuable in this situation. If you live in a no-fault state, this is a fairly straightforward issue; you’ll need to file a claim with your own insurance company, regardless. However, since Arkansas is not a no-fault state, as an Arkansas driver you’ll likely benefit from having uninsured or underinsured coverage. In certain states, UIM (Uninsured Motorist Coverage) is mandatory, while in other states the insurance companies are required to offer a minimum amount of UIM. UIM coverage is not currently mandatory in Arkansas. Another option for protecting yourself against hit and run accidents would be to have PIP (Personal Injury Protection) coverage. If you’ve been injured in a hit and run accident, you’ll likely be able to claim medical expenses and lost wages under PIP coverage. In no-fault states, PIP forms part of the mandatory coverage. In Arkansas, PIP coverage is an optional add-on to insurance policies. If you’ve been involved in a hit and run accident, you must report the accident to police and to your insurance company within a reasonable period of time in order to make claims on your insurance policy. It can sometimes be difficult to prove that your vehicle was hit by another vehicle, so we strongly recommend contacting an experienced attorney to help you make the claim. Call Taylor King today at 870-227-9732 for a free consultation on your hit and run accident.